The phrase ‘Fair Trade’ has been in the press a lot of late. Kit Kat, Cadbury’s and organic chocolate connoisseurs Green & Black’s have all pledged their intention to go Fairtrade, and not long ago, Fair trade was named by the BBC as one of the ‘Words of the Decade’. In amongst this positive Fair Trade climate, it’s great to be celebrating World Fair Trade Day. This event has been promoted since 2001, and this year falls on the 8th May. This year’s Big Day For The Planet will be recognised the world over, with events co-ordinated by the World Fair Trade Organisation – the global representative body of more than 350 organisations with a 100% commitment to Fair Trade. The WFTO touches the lives of 110 million farmers, artisans, retailers and supporters worldwide. It’s impressive work. You can check out planned events on the World Fair Trade Day website, including the London Fair Trade Festival (running from the 7th-9th May), which promises to be a real treat. However for those who don’t reside down in the Big Smoke (that’s us included! ), we want to celebrate in another way, by giving away a selection of our favourite fair trade goodies. 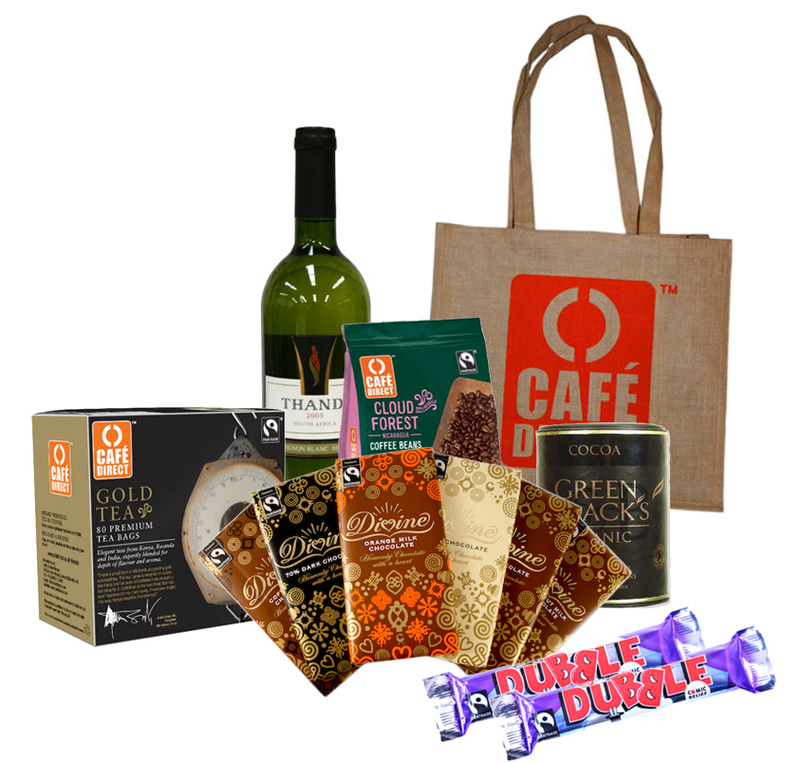 Including a tasty selection of Divine Chocolate bars, some of our favourite Fairtrade labelled Thandi wine, Cafédirect tea and coffee and Green & Black’s cocoa, all delivered to you in a reusable Cafédirect jute bag, our Fair Trade prize is sure to tickle the taste buds. Which year did the WFTO start to promote World Fair Trade Day? Please enter the letters in the proceeding image in the box below. Editors decision is final. You must be over 18 years to enter. No cash alternative. Competition closes midnight 10th May. Next story Dubble Chocolate’s 10th Birthday!